-mix all of these in a saucepan and heat until simmering. Allow to simmer for 5 min until everything is aromatic. Be careful to stir often and to not let burn! -mix all the dry ingredients in a big bowl. If you are short some, don't worry about it. Add more of something else. The oats are key and then I use whatever I have on hand for nuts and seeds. If you don't like one ingredient, leave it out. -pour the hot liquid in the bowl of dry materials and mix well, coating everything. -spray baking sheets with cooking spray or cover in parchment. Flat cookie sheets will not do! The oats are simultaneously sticky and slippery until cooked and will fly everywhere if they aren't contained on your cookie sheet! -spread the mixture evenly onto baking sheets. -bake in the oven, tossing the oats every 15 min or so. At first it will seem like nothing is happening, but after about 30 min they will start to brown quickly. So keep an eye on them and keep tossing! 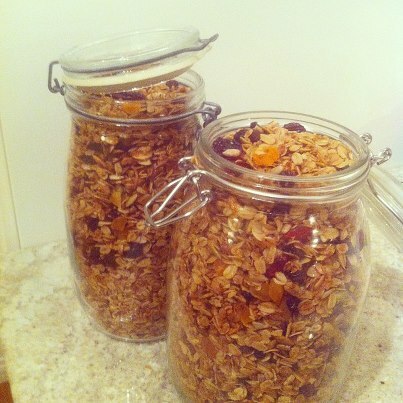 -add any dried fruit that you like (or none at all) to the cooked granola and store the granola in air tight containers. *Note: I once made the error of roasting the fruit with the oats. Don't do this as they will come out brown, shrivelled and super chewy! The granola is much more beautiful when the fruit is added later and the colours of the apricots and dried cranberries are set against the roasted oats and green pumpkin seeds. Makes a nice gift!